The aerobin is appearing to work well. I have continued to pile in layers and layers of organic matter and still it sinks further and has a good temperature. The main challenge is having it take in the guinea pig paper every second day or so. As this isn’t shredded I usually add it and then water it over to help it break down quicker. The addition of fresh, green grasses and weeds from the garden seem to really assist with the raising of the temperature. Last Tuesday (21st) was quite a beautiful day and it was as though the flies arrived all at once. Blowflies were out in good numbers! After observing the difference between the horse manure and the sheep manure I would have to say that the sheep manure is much richer and attracts the red wriggler compost worms whereas the horse manure once broken down attracts more of the native worms. After replacing the agapanthus at my mother-in-laws house with roses that she had in pots I wasn’t sure what to do with the agapanthus, weeds and grasses left over. In the end I brought it all back home and put some in the aerobin and the rest I piled up around the side of the house and placed a black tarp over it weighted down in the hope that it will eventually decompose down and I can either use it in the garden or feed it into other compost piles once there is more room. I am interested to see how it goes. In the past fortnight the spinach is doing really well, the alpine strawberries are flourishing and setting good fruit counts. The lime is about to flower again though doesn’t seem to want to set fruit. The lemon is still holding its fruit and will probably be relieved of these this weekend in order to allow further flowers to fruit and to assist with its postural development. Most of the garden is doing really well. The pepino cutting I was given is really taking off since I have planted it out and the weather is warmer. I plan to grow it up along a fence trellis. I have moved both the water drums/tanks. One is at the far back filled with water and newspapers as I am wanting to see how well it breaks down and also how quickly it breaks down once put out into the garden in a more liquid state. I have a theory that given that it is an organic medium, if I can break it down and add some nutrient value to it such as mollases for mirco-organisms and some blood and bone, then maybe it will make a good mulch or soil builder – much like the horse manure has been. If this is the case – and I hope it to be so – then I envisage it enabling me to add it regularly to the garden in similar cycles to that of adding manures or pea hay. The other drum is under the house next to the aerobin to be utilised as a compost tea brewer. The choko on the west side is doing really well. Others planted in the garden to be trained up the mallee’s are not as quick, possibly due to less water. The grape canes are all breaking out in leaf. The red cabbages are starting to take shape slowly and the celery over the last month or so has been really affected by what has almost been a plague of slugs. They are everywhere and I am wondering if it has been because of the horse manure – given that it has kept the soil moist and there has been lots of green leafy growth around. For the longest time the celery was unaffected by anything and then gradually it has succumbed. I have taken some plants out altogether and am down to about four. 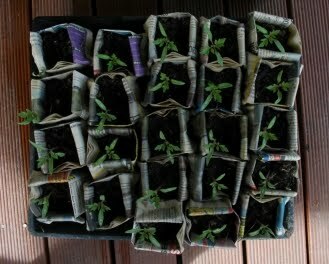 I have planted other seedlings and some are in my paper pots ready for planting out. Regarding the paper pots. I have made the following observations. As far as allowing the seedling to send out roots and remain relatively undisturbed when planted out they are fantastic. Even nasturtiums planted out into drier soil or showing none of the indications of wilting that you would almost expect from planting out normally, even in well watered soil. The unique feature I have discovered is that given the water is taken up by the paper it is also easily evaporated from the paper and this has meant I have really had to watch the water and make sure the seedlings are not drying out. Fitting the pots into trays where I can saturate the bottom has worked well as the pots basically then act as a wick to carry water to the growing seedling. I lost several celery seedlings before I realised what was happening. Despite damp weather the wind and sun action alone still tends to dry out the pots consistently. I am excited by the discovery of these pots though and even though they take some time I really think they are worth the effort. Above: Red and Yellow Cherry Tomato seedlings from last summers favourites transplanted into pots for further growing out before either planting once space becomes available or for giving away.